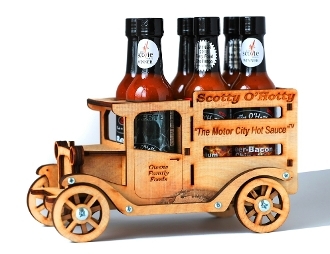 "NEW" The Motor City Hot Sauce Delivery Truck is the coolest hot sauce gift ever! This is the ultimate gift for that Chili Head on your shopping list! You will also receive all six of our Award Winning Hot Sauces! The Scotty O'Hotty truck is hand crafted & fully functional! Get one while supplies last!